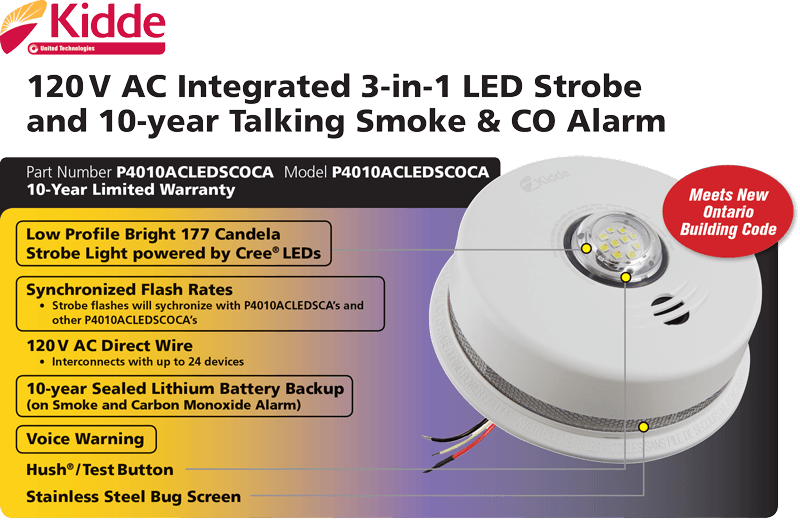 The Kidde P4010ACLEDSCOCA is an integrated 120V AC wire-in smoke and carbon monoxide alarm with 10-year sealed battery backup and LED strobe light that provides temporal patterns, visual and voice warnings. The model P4010ACLEDSCOCA is equipped with a 177 candela strobe light (powered by Cree® LEDs), designed to notify the deaf and hard of hearing. The unique design measures only 5.8cm (2.3”) in height, when mounted. The P4010ACLEDSCOCA will produce a steady flash warning (once per second) if smoke is detected, and sound 3 long beeps, followed by “Fire! Feu!,” repeating. If carbon monoxide is detected, the LED strobe will flash 4 times, go off for 5 seconds, repeating, in time with beeps, followed by “Warning! Carbon Monoxide! Monoxyde de carbone!”. In an alarm condition, strobe flashes will synchronize with other interconnected P4010ACLEDSCA and/or P4010ACLEDSCOCA alarms. The P4010ACLEDSCOCA is cUL Listed and has a 10-year limited warranty. • Integrated Photoelectric Smoke Alarm, Carbon Monoxide Alarm and LED Strobe Light – A single unit can be installed, where previously a separate smoke alarm, separate carbon monoxide alarm and separate strobe light were needed. It requires only one electrical box, reducing labour costs and installation time. No relay required. • Low Profile Bright 177 Candela Strobe Light powered by Cree LEDs – Light level proven effective in warning those with hearing loss. Attractive low profile design. • Synchronized Flash Rates – Strobe flashes will automatically synchronize (flash at the same time) with other interconnected P4010ACLEDSCA’s and/or P4010ACLEDSCOCA’s, in an alarm condition. Note: Will not synchronize during test mode. • 120V Interconnectable with 10-year Sealed Lithium Battery Backup (on Smoke Alarm) – Will interconnect with up to 24 other Kidde devices. Battery backup provides 10 years of continuous protection. Note: battery backup will only power the smoke and CO alarm. • Voice Warning – Announces “Fire! Feu!” or “Warning! Carbon Monoxide! Monoxyde de Carbone!”. • Hush® Feature – Temporarily silences nuisance alarms for approximately 9 minutes (smoke must be present before Hush® is activated). • Test Feature – Simultaneously tests the unit’s electronics and verifies alarm operation.